Perfecting the trend in shorter/wider/thinner freeride boards, the Titan 120 and 130 offer extremely early planing and great all-around freeride performance with minimal effort. The relatively long, flat rocker makes the transition from non-planing to planing, getting into footstraps and planing through lulls nearly seamless. 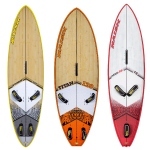 The rocker and compact outline also make the Titan less sensitive to “fore and aft trim” than other boards—giving them a very wide “sweet spot.” This makes going upwind and jibing at both low and high speeds extremely easy. A slight kick in rocker in the last few inches of the tail also gives the Titan great top speed when compared to “the competition”.